Finland not only has superb hiking, backpacking and paddling to offer, thanks to the ice age, which stopped here 10.000 years ago, the country also has plenty of superb boulders for climbing - many of them in Southern Finland. 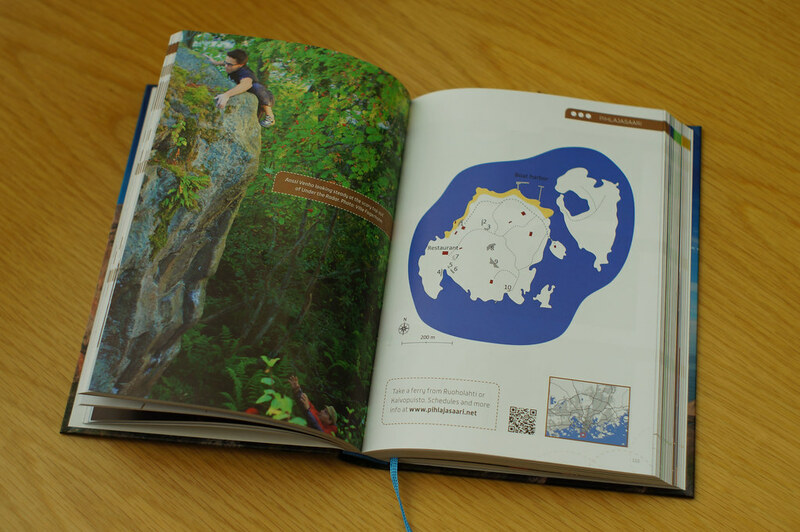 If you visit Helsinki for business or pleasure, make sure to take along your climbing shoes and a copy of the Southern Finland Bouldering Guide to check out the local rocks! The Southern Finland Bouldering Guide came out earlier this year, and is a completely self-published book. 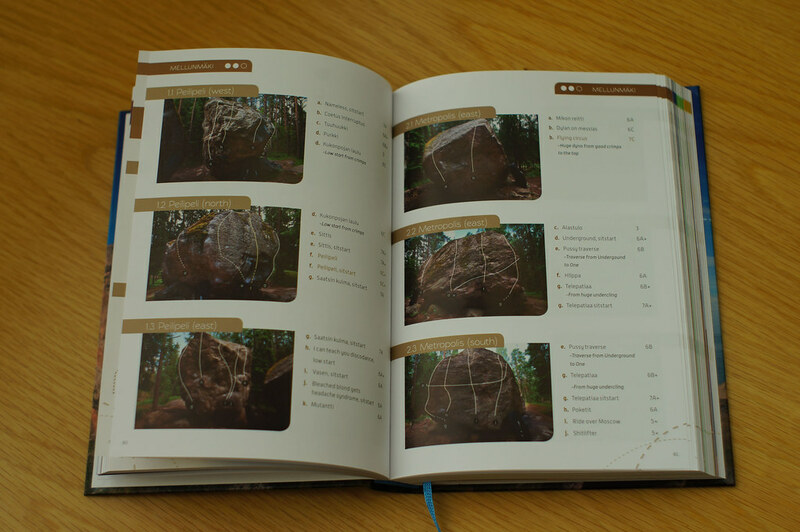 As I know how much work goes into making a book, it is great to see that the three authors have produced such a high-quality book which certainly will set standards for bouldering guides in Finland. Alone that it is bilingual - Finnish and English - is a superb accomplishment which needs to be applauded! Take a look in the book here and see for yourself how well made it is! The book starts off with a brief introduction, followed by the Everymen’s Right and a How to use this book page and an explanation of the icons et al. If you’re new to bouldering outdoors, a Falling for dummies page tells you about spotting. After that it already jumps in and gives you a bit more background on bouldering in Helsinki and the area within Kehä III. There’s some fantastic spots here, with problems ranging from 4s to 8B+ - so really something for any skill level. Sectors start with a short overview, telling about the location and how to get there. At least in Helsinki you can get to most spots via public transportation, which is great news for those who visit the city on holidays. A good map helps you find the boulders then, and often also includes bus stops and other information which are useful. Then the book jumps in and shows the different boulders, with the problems as lines on them - just like you might know it from 27crags.com - which, btw, the books recommends for updated and new problems, too. The photos are good, though some really stand out as superb and get you very excited about the rocks. There’s no or little beta, so you can Flash the problems, too! Besides Helsinki and the Metropolitan area you will also find chapters on Hämeenlinna, “the Rest of Southern Finland” and Åland, which is widely considered one of the most beautiful and best boulder destinations. Looking at the photos and problems of the latter, I definitely see why! Bottomline: An excellent bouldering guide, jam-packed with exciting problems to add to you tick list. If you’re only faintly interested in bouldering in Finland, get this book. It will help you plan your boulder holidays in Finland, or lets you find problems in your neck of the city for a little evening entertainment. Whenever I head south, this book, my climbing shoes, chalk bag and possibly my crashpad come along, so that I can combine business & pleasure! Got curious? Hop on a ferry or plane to Helsinki and start bouldering! 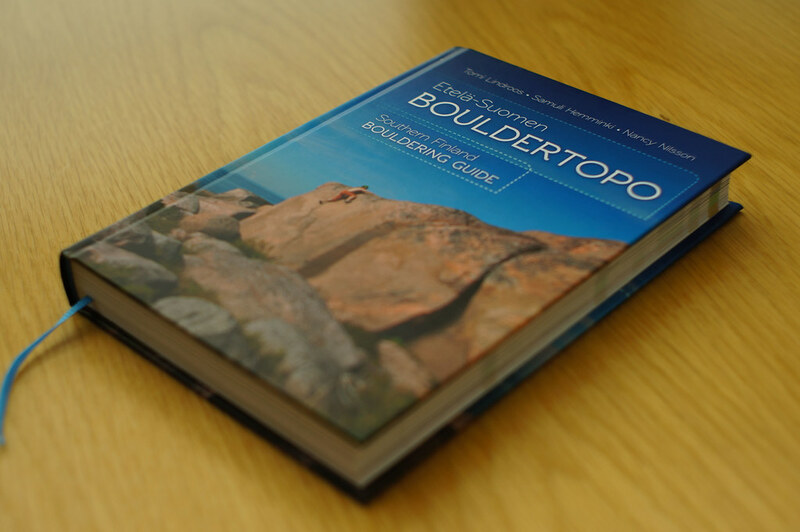 You can buy or order the book at Camu, Boulderkeskus, Mountain Shop and Kletterführer. Don’t forget your crashpad!